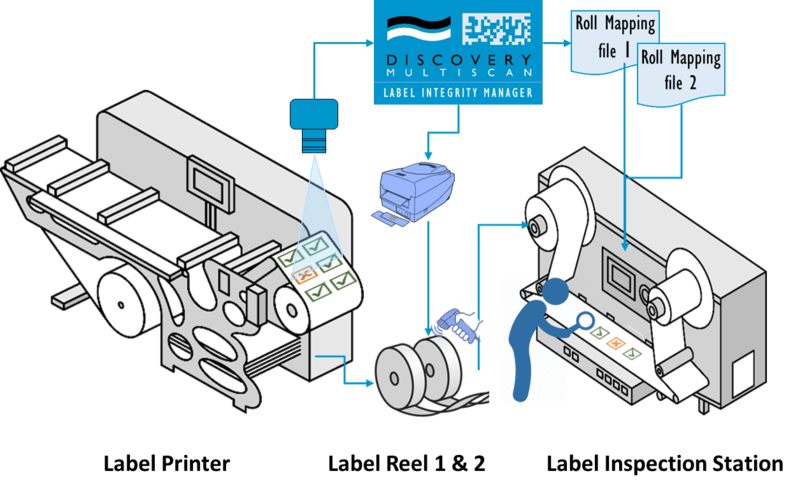 DISCOVERY Multiscan’s Label Integrity Manager (LIM) tracks and collates information on each label in all lanes independently, for print defects and logs the readability, data accuracy and the correct sequence of variable data printed on each label. Using the header information printed at the start of each label lane, LIM knows precisely the number of labels to expect in each lane as well as the start, end and the increment of the printed variable information (in instances where the label sequence is across the web) to determine that the correct sequence is being maintained. For random or non-uniform increments, the variable information captured can be matched against a look-up file or database to detect missing or out of sequence labels. The Label Integrity Manager maintains a detailed Roll Mapping file for each lane during the label printing run. After reading pre-determined trailer information, printed at the end of each lane, LIM reports on any sequence breakages, unreadable or missing labels. After each lane on the web has been slit and rewound onto multiple reels, LIM drives a Zebra printer to produce a “closure” label, incorporating an identifying barcode, for each reel. LIM also provides this support for turret rewinders. At the inspection station, by scanning the closure barcode on each reel, the correct Roll Mapping file is automatically selected for subsequent inspection. This greatly simplifies and speeds up the inspection process, removes operator error and provides the Label Printer and the client with a quality audit file for each label reel. With our new print-on-demand Tax Stamp production process we needed an inspection system capable of validating every Tax Stamp and reconciling the information printed on them against the original data file. Since implementing the system from Lake Image, we have experienced fewer stoppages, resulting in better overall productivity. We have greatly increased our capacity to catch printing or operational errors as soon as they occur, which if unchecked, could result in significant revenue losses for the Belgian Federal Finance Department.